AHS Rescue has a reputation for extensive knowledge and expertise in technical rescue equipment and training, including high angle rescue or artificial high directional training. AHS Rescue has a reputation for extensive knowledge and expertise in technical rescue equipment and training, including high angle or artificial high directional training. AHS Rescue partners with Ropes That Rescue to offer the Artificial High Directional Workshop (AHDW), a 7-day advanced level course for rope access professionals and emergency responders. This in-depth course is suited for a “train the trainer” class with information related to instructors of rope rescue pertaining to the proper use of any manufactured high directional. In addition, this class presents the types of hazards involved within confined spaces, and how to maximize safety. There is no prerequisite required, although the Personal Rescue Skills Workshop (PSRW) is recommended. The AHDW is a hands-on training course covering the correct implementation and use of artificial high directionals in wilderness and industrial settings. AHDW teaches professionals working with rope access the many benefits of using constructed frames in their work with proven high angle rope rescue techniques. This course touches on the use of advanced pulley systems, highlines and offsets, although focus is on constructed frames in general. 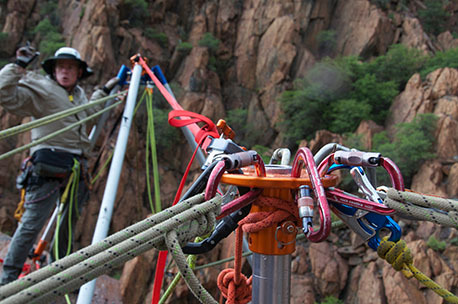 Students will learn the basic physics of high directionals with extensive knot craft lessons for securing the Arizona Vortex in several advanced setup positions, and the proper set-up method for any manufactured or improvised AHD. This extensive course also covers working with the Arizona Vortex bipod, monopod (gin pole), V frame, double A frame setups, tandem AHDs and so much more. Contact AHS Rescue today via email or complete the form on this page to sign up for training. You can purchase all your mandatory and optional AHDW equipment from AHS Rescue, the number one trusted source for reliable technical rescue equipment. We carry the specific high angle equipment recommended by training leaders, from well-known brand names that lives depend on. General mandatory equipment for all students includes the CMC Aztek ProSeries System. The Aztek is one of the most versatile tools used, providing more than 100 rigging solutions to rope access technicians worldwide. The Aztek ProSeries system is UL Classified to NFPA 1983 (2012 Ed), utilizing 50 feet of 8mm Aztek ProSeries® Cord with 100% high-performing nylon blend. Discover what this system offers in a compact and lightweight rigging system that is extremely efficient. The Arizona Vortex is a superior Artificial High Directional, and is also available from AHS Rescue. The Vortex is one, all-inclusive kit that can be set up as a monopod, bipod or tripod, A-frame or sideways A-frame, and many other possibilities. The AZV assists rope access when several lines are required over the edge with additional attachment points. AHS Rescue is well known in the industry of rope access equipment used by professionals making their living working at height, and technical rescue teams such as fire and police departments, and SAR teams. Our in-depth knowledge and extensive experience allow us to provide only the best in rescue equipment and training, including high angle training. Contact us today by email or complete the form below for more info on our training classes.